Early this year Fair Finance had the honour of attending the annual Community Development Financial Association conference and awards ceremony. Held at the Marriot Hotel, Shamima, Marvin, Faisel and Rob enjoyed fantastic seminars, a conference and a lovely stay in Bristol. For those of you who may or may not be aware, the CDFA awards are held to “recognise the excellent work of community development finance institutions (CDFIs) in changing lives and communities, and the inspiring individuals who work in the community finance industry”. Senior Loans Officer Shamima was nominated for an award in the category “Outstanding Loans Officer of the Year” (Congratulations Shamima!). This award has been designed to recognise an outstanding individual contribution to the Community Finance Sector. Shamima and Marvin (Our collections champ) blogged their way through the event, just so you wouldn’t miss out. What were the highlights of the event? What did we learn? Did Shamima win? 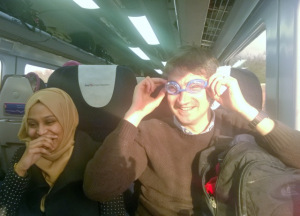 Rob had heard there was flooding on the train line from London to Bristol so came fully prepared with a pair of swimming goggles! Don’t worry next year will be ours! Despite missing out on the Impact Award the night was soon to take a turn for the better. 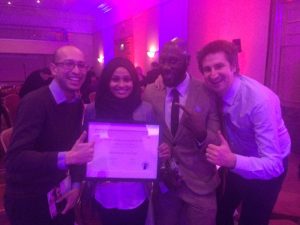 Shamima had been nominated for the Outstanding Loan officer awards against six other nominees. To her surprise (but not ours) Shamima was named the winner! To start the day, Rob made use of his goggles and swimming trunks and took a dip in the pool. The team also sat down to a delicious breakfast- a Full English! The conference commenced at 9:15am with a brief summary about the day’s agenda by Jonathan Diggines (chief executive of Enterprise Ventures). Elaine Moore, journalist of FT Money hosted the first plenary of the day where the topic up for discussion was new horizons for a new industry. We discussed sustainable growth and diverse finance solutions as well as deciding whether we need a radical change. Although change is on the way with the growth of community finance, crowd funding and an increase in challenger banks, we discussed if a reform was needed to achieve a better finance services industry. The team were each given the opportunity to choose a seminar group that they would like to attend. Shamima and Marvin attended the Ethical Alternatives to High Cost Credit seminar whilst Faisel attended CDFIs as a community bank, and Rob attended Local Enterprise Partnerships, Funding and Access to Finance. In Shamima and Marvin’s seminar they learned about the payday loan scheme which is being piloted by London Mutual Credit Union. Gareth Evans, associate research manager, discussed how CDFI’s can achieve the profile and scale like Wonga as well as discussing what policy, funding and products are needed. Perhaps Fair Finance can adopt this method? 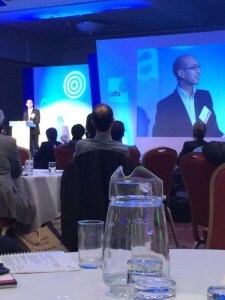 Faisel was a keynote speaker at the conference and he talked about the vision for the sector over the next 3 years. He made some very essential points when comparing the CDFI to Wonga. For example he compared the income that is generated between them- across all CDFI’s multiplied by ten didn’t come close to the income Wonga makes alone in one year. However he did give an important message- to have some impact in the sector CDFI’s needed to build strong partnerships alongside mainstream financial institutions and they have to reduce reliance of funding from the government. Nigel Kershaw of @BigIssueInvest -“we need more capitalisation in the sector” #CDFA14. Nigel Kershew OBE, The Big Issue, explained one other innovation that was of interest of Shamima and Marvin. The new advance comprises of Experian uploading data on individual rental payment history from the Housing Associations. This is in order to enable their credit score and to acknowledge whether they manage their rent payments. It also gives clients the chance to build their credit profile. It was a pleasure to be part of the annual conference, hearing everyone’s view on the sector and what more could be done by individual CDFI’s. Subsequently there has a common theme where everyone is aiming high but without the capitol in place, it would not be possible. There were some intuitive discussions providing solutions, strategies and alternatives providing knowledge for current and future products. Here are some comments from our award winning loan officer, Shamima, and our Collections Champ, Marvin.